The page title is also what the searcher sees in a search result -so the page title - meta title tag is very important in describing what the page is about and if the title meets the searchers criteria, then it is more likely to be clicked on and your page will open. From an SEO perspective, the title of the webpage is very important, these are the words that describe what your page is about and it is the first words that a search engine sees when it crawls your webpage looking for content to add to its index. The page title is also what the searcher sees in a search result -so the page title is very important in describing what the page is about and if the title meets the searchers criteria, then it is more likely to be clicked on and your page will open. It is safe to assume that the majority of searchers these days will be tempted to either click or ignore based on the content of the title. This is like your ad in the natural search section of the search engine results page. Now that the impact of the title of the webpage is obvious, let us explain how to write an effective and powerful title. The webpage title aka the title tag is the synopsis of the content of the web page. So, as no two pages on your website are the same, hence why should their title tags be? Therefore, as a general rule, title tags for each page on your website should be unique. This is an added bonus from an SEO perspective, because now you can target many more keywords and hence spread your reach across search engine indexes. The second thing to consider is whether you want to add your company name in the title tag? The answer is that it depends on your branding strategy. If your company name is a known brand, or if you want to promote your firm name as a brand or if your company name consists of keyword(s) that you want to target such as ABC Family Solicitors targeting the keyword "Family Solicitors", then by all means add your company name in the title tag. If not, then use the limited but valuable space to add your targeted keywords. If you do decide to add your company name, make sure that it is at the end of the title. This is because you want search engines and your visitors to first read the targeted keyword(s) for that page and then the company name. It is important to remember that as the title tag is the synopsis of the content of the web page, we need to make sure that the title tag is relevant. For example, the title tag for an about us page is "About Website Design Company - ECommerce Partners". Hence, the title tag does its job of informing what the page is about. Now, you might have noticed that instead of "About Us - ECommerce Partners", we added "About Website Design Company - ECommerce Partners". The reason is because "Website Design Company" is one of the key phrases we want to target and so, we replaced "About Us" with "About Website Design Company". This brings out an important point. We need to do a keyword analysis before we write an effective and powerful title tag. Keyword mining and analysis is a very important part of writing compelling page titles and is a part of the Search Engine Optimization service that First One On provides to our clients. The next step after keyword analysis will be to write down title tags for each and every webpage on your website. Please be careful when writing title tags and never, never over stuff keywords in the title. 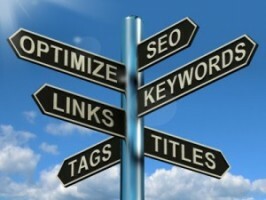 Doing so will undermine the power of title tag and defeat the purpose of better ranking in the search engines. The title tag is the title of your web page and so it must be relevant and meaningful. Remember, this is the title in your AD in the natural search listings of the search engine. General Suggestion: you cannot promote all of the keywords in one page, normally, you should promote 3 to 5 keyword phrases per page. The 'Title tag' should contain up to 3 important keywords that match to the body of the page contents. If the keyword you are trying to promote is highly competitive, you can consider repeating the important keyword twice in the first 100 words of the page content. Limit the length of the title keywords to 65 characters including spaces or less. There's no reason to cut off the last word and have it replaced with a "..." Note that the search engines have fluctuated recently and Google, in particular, is now supporting up to 70 characters. Use a divider when splitting up the keywords, we generally recommend the use the "|" symbol aka the pipe bar. Others choose the arrow ">" or hyphen "-" and both work well. Re-using the title tag of each page as the H1 heading tag can be valuable from both a SEO keyword targeting standpoint and a user experience improvement. Users who go to the page from the search result listing will have the expectation of finding the title they clicked on. Users will be more likely to stay on a page they're reasonably certain fits their intended search query.